While going through past blogs prior to the NHL Entry Draft, I came across a piece from 2015 just prior to the draft. In it we looked at the defense core depth and it was extremely thin at the time. The 2015 Stanley Cup playoffs showcased a Norris Trophy defenseman in the Chicago Blackhawks' Duncan Keith and a future Norris winner in then 24 yr. old Tampa Bay Lightning d-man, Victor Hedman (who just won the trophy last night.) The duo put on a clinic in the finals that year. The Sabres at the time were coming off a scorched-earth rebuild that left their team mostly barren on the back-end. At the time just before the 2015 NHL Draft, the Sabres had young players with promise in 23 yr. old Mark Pysyk, 20 yr. olds Rasmus Ristolainen and Nikita Zadorov and...that's about it. The pipeline had Jake McCabe and Chad Ruhwedel at the top followed by Brady Austin, who played five NHL games and Jerome Leduc, who never saw the NHL ice. Anthony Florentino and Brycen Martin, both of whom are in the minors, rounded out the group. Since that piece was done, the Sabres traded Zadorov and Pysyk and allowed Ruhwedel to walk. Buffalo's depth on defense struggled for the last three seasons as players drafted beginning in 2015 began making their way up through the system and GM's tried to fill holes with minor-league vets and free agent signings. The Sabres did well in landing coveted college free agent Casey Nelson in 2016 and SHL Defenseman of the year, Lawrence Pilut last month. They also signed Victor Antipin out of the KHL in 2017 but that didn't work out so well. Antipin had a rough season that ended with him being carted off on a stretcher with four games to go. Buffalo GM Jason Botterill recently said that, contrary to some reports, Antipin has not signed a KHL contract and is looking to come back to the NHL. As dreary as the last few years have been on defense, there is light at the end of the tunnel and the drafting of defenseman Rasmus Dahlin will shove this slow moving train even closer to the bright light of tomorrow. Dahlin is considered a franchise defenseman (some say generational) and will immediately be plugged into the lineup in a top-four role. What that does for the depth chart can't be understated as those on the big club will begin to fall into roles to suit them while those in the pipeline can continue to develop at lower levels. There are still big holes on the back-end from Buffalo on down, but make no mistake, the selection of Dahlin allows for the organization to build quality depth, something that's desperately needed. Barring any trades, the Sabres lineup on defense looks to have Dahlin, Rasmus Ristolainen, Marco Scandella, Zach Bogosian, Jake McCabe, Casey Nelson and Nathan Beaulieu right now with the possibility that their top d-prospect could be in the mix. Although semantics will have Dahlin as the Sabres top prospect from the time he's drafted until opening day, why bother putting him there for this exercise? We'll start with the idea that he'll be with the Sabres beginning October 4 against the Boston Bruins and look at these tree as Buffalo's top d-prospects right now. Guhle began his first pro season with the Rochester Americans and spent plenty of time playing top-pairing minutes in all situations. There's a lot to like about the 6'2" 196 lb. 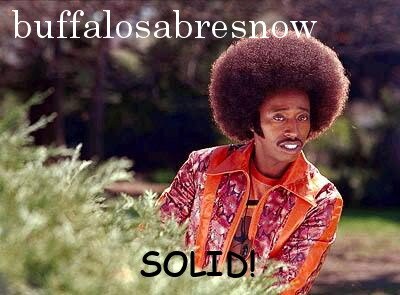 native of Edmonton, Alberta and Sabres fans are still wondering how he dropped to Buffalo at pick No. 51. Guhle is very athletic and skates extremely well, has exceptional on-ice vision and moves the puck seemingly with ease, all of which was on display in Rochester to start the season. However, Guhle did hit some speed bumps along the way. After a short, two-game call-up in January he was sent back to Rochester and suffered a lower body injury. He would be recalled again for an extended 16-game stint in Buffalo where he struggled a bit before being sent down to Rochester for the AHL playoffs at the end of the NHL regular seaosn. In the latter part of that call-up he suffered an upper-body injury that cause him to miss an April 2 game against Toronto. He seemed well after that but had a miserable performance as the Amerks were swept by the Syracuse Crunch (TBL) in the first round of the Calder Cup playoffs. What happened to Guhle, when it happened and how much it affected him is still somewhat of a mystery but his playoff performance against a very fast and talented Crunch team left the organization with question marks. Maybe he's not quite ready to join the Sabres on the opening night roster and will need a little more seasoning before he and the team can feel comfortable with him up in Buffalo. Having Dahlin in the top-six is huge for the organization as they can do what Botterill wants to do with all of his prospects, let them fully develop before bringing them up. If Guhle has an outstanding camp and makes the opening night roster, fine. If he doesn't he can get more seasoning in Rochester. It's a win/win for player and team. This could be a huge signing for Buffalo as Botterill and Co. were able to land the SHL's 2018 Defenseman of the Year. The 22 yr. old Pilut has been playing in Sweden's top professional league for the last four years and had a breakout 2017-18 campaign with 38 points which lead all SHL defensemen. Pilut is an offensive-minded defenseman who skates well and has a good shot which you'll see in the highlights that are out there but here's what his coach, Johan Lindbom also had to say about his defenseman. "Larry (as the team called him) was very talented at a young age," said Lindbom. "Maybe a little too small from the beginning but he's a fighter. He takes his hockey very seriously. He practices very hard and that's what makes him successful. "He's not the toughest, he's not the strongest in front of the net but he reads the play really well." Lindbom and his staff were keen on honing the defensive aspects of Pilut's game as the 5'11" 179 lb. rearguard never saw a play he didn't want to jump into, and that's what he'll need to work on in North America, especially with the smaller rink. Were it a year or two ago, Pilut could have been considered a candidate to make the Sabres if he had a strong camp. Right now, with the addition of Dahlin and having Guhle with a full pro season under his belt, Pilut slips nicely into the No. 2 d-prospect spot. 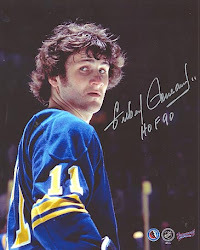 There was a lot of fear rippling through Sabreland wondering whether or not the Sabres would be able to sign the St. Cloud State University standout. Buffalo fans had already been jilted by Jimmy Vesey and Cal Petersen, both college prospects who finished school and opted for free agency. Borgen, however, chose to sign with Buffalo after his junior season in college. The 6'2" 189 lb. native of Moorehead, MN finished his career with five goals and 36 assists in 106 games for the Huskies and came in for a brief eight-game cup of coffee on an amateur tryout with the Rochester Americans this season. Other than his NHL-ready frame, one of the things that stands out with Borgen is that he's a righty, something severely lacking in the Sabres d-prospect pool right now. He's also a defensive defenseman but don't let that lead you into believing he's some pylon on the back end as he has excellent skating ability. Borgen was tabbed for the 2016 US World Junior squad and was also selected for the 2018 Olympic team, though he never dressed. He's projected to be a long-term project player that will continue to hone his defense while trying to find some of the scoring touch he had in high school. With Dahlin Guhle and possibly Pilut paving the way the next few years, Borgen will have all the time he needs to develop properly.